All tutorials take place at the East-West Center’s Hawai’i Imin International Conference Center at Jefferson Hall, 1777 East-West Road, Honolulu. RIDE: Lyft and Uber are approx $10–12 and 10 minutes. 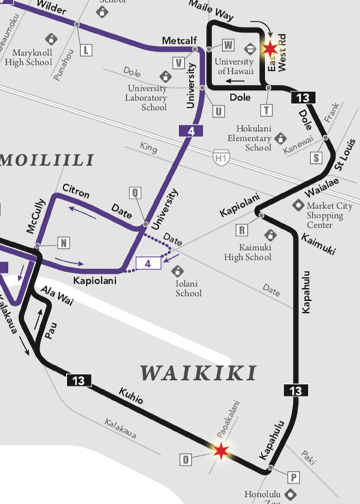 BUS: Route 13 runs between the Conference Hotel and the East-West Center’s Jefferson Hall about every 15 minutes. The ride is approx. 20 minutes; timetable here. You can buy tickets from the driver but you need exact change: $2.75 single trip, $5 day pass. From the hotel, take “#13 WAIKIKI – UH Manoa”. Returning from East-West Center, take “#13 LILIHA – Wyllie Street”. Tutorials are open to EPIC2018 attendees only and pre-registration is required—you can purchase tutorial tickets during conference registration or modify your registration subsequently to add a tutorial. No on-site registration. Even when businesses boldly claim to be data-driven, decision makers routinely review just a basic handful of metrics related to impact, significance, and foresight. This tutorial will unpack some of these key stats, empowering you to understand and influence how they’re created, used, and—yes—abused. How can ethnographic and design researchers guide the design of cognitive systems that enrich and effectively support human beings? Build practical tools to adapt research methods and outputs to have an impact in this rapidly expanding domain. This tutorial will share essential skills and methodologies from applied foresight research: signals (aka horizon scanning), drivers (aka megatrends) and scenarios. Participants will practice the skills and discuss how to implement them in different kinds of organizations. In this interactive tutorial you’ll develop your own story to advance your career goals. With instructor guidance and peer coaching, you’ll learn tools and frameworks for positioning your skills and experiences to successfully navigate career transitions and challenges. Whether you use short video clips in a PowerPoint deck or develop standalone documentaries, you’ll explore the journey from raw footage to final deliverable, map workflows, and reflect on the unique responsibilities that come with this form of ethnographic “evidence”. Learn how network analysis and graph theory can be used in conjunction with ethnographic research to understand human behaviour and discover how people, events, and ideas relate. Data science and algorithmic systems are having an increasingly profound influence on our organizations and clients, not to mention our research participants and their cultural worlds. In this tutorial you’ll build an ethnographic toolkit for understanding the practices and impacts of data work. Eye tracking is increasingly popular in UX and applied consumer research. Can this technology really measure attention and reveal subconscious behavior, or is someone trying to sell you snake oil? How can the cognitive psychology of visual perception and cognition intersect with ethnographic research? Get a solid foundation in the art of observation as a field research method for human-centered design and innovation—and an effective toolkit for training team members or stakeholders. You’ll explore four key techniques, then get outside and practice using them. From recruiting to fielding research, mobile tools can dimensionalize ethnography and enrich our practice. This hands-on tutorial covers research design, context-rich data collection, and combining mobile tools with both traditional ethnography and quantitative analysis. Ethnographers are known for studying people in their naturalistic, everyday environments. How can we anticipate their engagement with products and experiences that don’t exist yet? This tutorial will give you an essential toolkit for using models—from simple paper prototypes to simulations—to study the objects and services of the future.